PCT Vice-Moderator Chiohh Lyiam-Syian was invited to visit Presbyterian Church in the Republic of Korea (PROK) and participate in its General Assembly Annual Meeting in mid-September. He shared with the assembly PCT’s “One-leads-One New Doubling Movement” and also provided a status update of Taiwan and PCT. 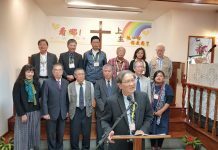 Chiohh told Taiwan Church News that PROK highly valued its partnership with PCT and its ministries in Taiwan and took a particular interest in the progress of Amis and Taroko presbyteries as some of its presbyteries have partnerships with these two presbyteries. He recalled many people had come to him during the General Assembly Annual Meeting to enquire about how these two presbyteries were doing. 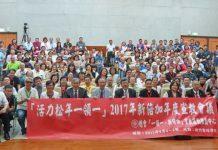 During one of the breakfast meetings at the General Assembly Annual Meeting, Chiohh introduced PCT’s “One-leads-One Doubling Movement” to his hosts and delegates from other countries. He highlighted that 2015 would mark the 150th anniversary of PCT and in face of Taiwan‘s predicament in the international community, PCT will need a boost in membership and maturity before then. He also stressed that PCT had much to learn from PROK’s assertiveness and passion for missions.